One of the most surprising moments of the 9th International Symposium on Cultural Gerontology (also the first ENAS/NANAS Joint Conference and the 3rd ENAS Conference) was when Plenary Panelist Stephen Katz asked the audience members to hold up a hand if they had a degree in ‘Gerontology’. I twisted in my seat to get a better look across the crowd but I only saw about a half-dozen hesitant arms poking out of the full lecture hall. The point Katz was making was that ‘cultural gerontology’ remains an assemblage of different discipline-based concepts and methodologies. Even after all these years, the infrastructure hasn’t emerged that could establish the key concerns, questions and concepts that social science and humanities scholars call ‘gerontology’. My degree, and my training have been in anthropology, and I’ve relied mainly on self-study (going to public seminars, conferences, and a lot of reading) to feel confident in teaching and doing research about ageing. As others who followed a similar approach would probably have observed, this approach leads to view of gerontology as fractured and often at odds with itself rather than a coherent but multi-disciplinary area of study. Producing a gerontology that is more than the sum of its disciplines has been a driving force (and challenge) of groups like the International Network of Critical Gerontology. Cultural gerontology today might be seen as a kind of broad umbrella that brings critical gerontologists (mostly from the social sciences) and the humanistic gerontologists (from philosophy, cultural studies, literature and media) together. Most panels at the conference reproduced this divide between the two ‘new’ gerontologies, but there did appear to be a real interest in mixing things up more. As Kroeber noted, anthropologists like to think of their work as the most humanistic of the sciences and scientific of the humanities, so it would make sense that we could step in and bridge some of these groups. But as I looked around, I also had to ask myself, where were the anthropologists? 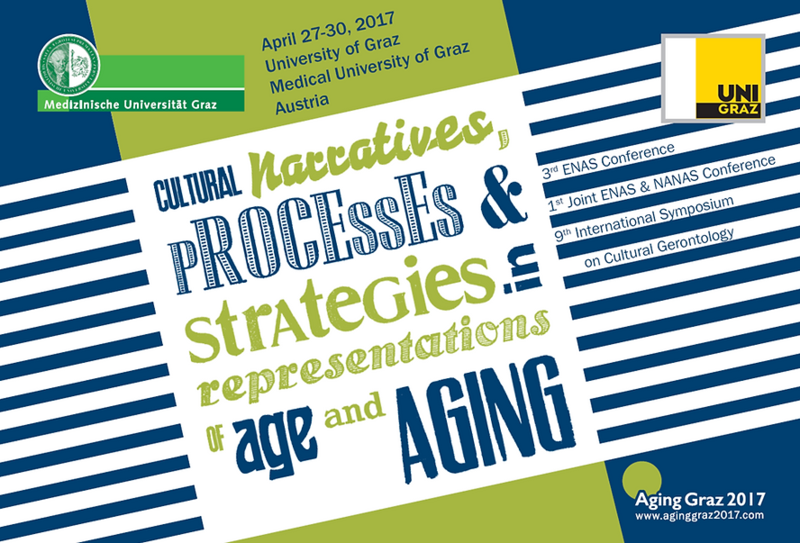 The International Symposium on Cultural Gerontology (held 27-30 April, 2017 in Graz, Austria) only convenes once every three years, so many of the delegates had known each other for nearly three decades and had seen age studies grow and develop thanks to some of the groundbreaking work by many of those in attendance, including historians, sociologists, gender and cultural studies. 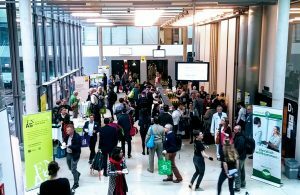 Many of these key figures appeared several times in the program, as keynotes, plenaries, and presenters, evidence of the continued centrality of their work and their energy and passion for breaking out into new areas of research. Around this core group of cultural gerontology pioneers, there were plenty of young, bold and creative scholars, many coming out of feminist and queer studies traditions, media studies, and literature. 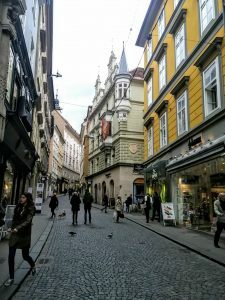 For those who attend the big gerontology meetings like the upcoming IAGG or the GSA, panels like those at Graz can get lost in the sea of more standard health, psychology and social care oriented work. So it was refreshing to have so many critical and imaginative age studies scholars from all over the world in one place. 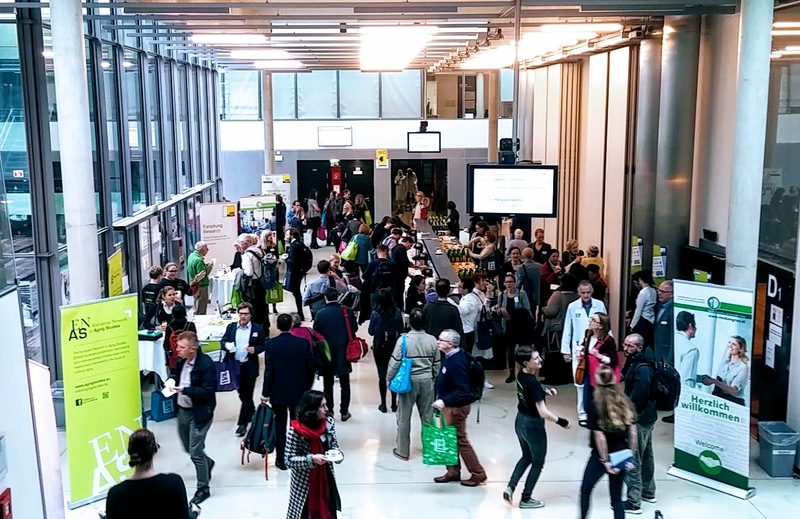 With a theme like ‘Cultural Narratives’ you might think it was an anthropology conference, but of the 334 participants, there were only a handful of anthropologists (I counted five) presenting research. What this meant, in part, was that while delegates themselves represented a broad range of countries from six continents, and there was plenty of interesting diversity in material presented, I noticed a general lack of conceptual attention to what exactly ‘culture’ meant in the research. At times it appeared to stand for the creative endeavors (literature, film, and other forms of image-making), while at other times, it figured implictly as a kind of backdrop in front of which individuals were contending with universal life-course processes of age, illness and mortality. It struck me that anthropologists, who have been thinking about what culture is for quite a long time might have something to contribute to cultural gerontology in this regard, pushing these assumptions about culture into a more critical frame. Interestingly, this is just what one of the Plenary Speakers, Jane Gallop (Univ. 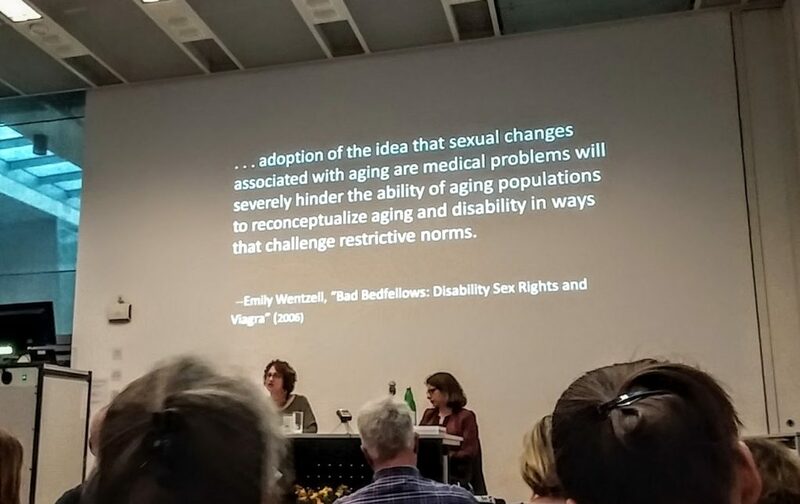 Wisconsin Milwaukee) did during her presentation on “The Phallus and its Temporalities: Sexuality, Disability, and Ageing.” Breaking out of her psychoanalytic/queer/crip studies interpretive frame, she quoted at length from AAGE member Emily Wentzell’s work on erectile dysfunction and masculinity in Mexico (photo below). So, even if there were few of us present, our work does seem to carry influence beyond our discipline. The Material Side of Aging: Doing Age with Things was organized by anthropologists working in Germany. Carolin Kollewe, a social anthropologist working at the institute of Gerontology at Heidelberg University, presented research on intergenerational relations and the ways they are shaped by the assistive technologies that enter into these relations. Monika Urban (Institute for Public Health and Nursing at the University of Bremen) presented on ‘digital aging’ and particularly the ways health technologies ‘enable new experiences of ageing,’ and ‘evoke new demands and responsibilities’. Lucia Artner, a social anthropologist at the Department of Social Work and Organization Studies, University of Hildesheim, looked at the spatial and material aspects of institutional care, while Daniela Böringer and Jasmin Richter (also at U. Hildensheim) analysed video data that capture the ways carers interact with the ‘affordance’ of everyday objects. My own paper drew out some contrasts between the meaning of ‘being together’ in Japan and the UK. Others on the panel looked at the ways people with dementia come to see institutional spaces as ‘home’, and the ways nursing students imagine (and draw) an ‘old person’. The great thing about an interdisciplinary panel and conference is that you don’t have to worry about sounding a little lost (blame it on the fact that it’s just not your field). As a result, the discussion that followed was lively and free-flowing, creating links between the papers and opening up new lines of thought. Another highlight was a panel on Meaning in Life and Social Connectedness in the Ageing Process: A Humanist Perspective. This panel highlighted the anthropological and multi-disciplinary work on “Meaning in Life and Ageing Well” by scholars at the University of Humanistic Studies at Utrecht. Unfortunately I missed the panel, but I did get to have lunch with Pien Bos, Wander van der Vaart and Anja Machielse, and I was impressed not only by the ways they seemed to work together despite coming from different perspectives, but also their interest in bringing philosophy and anthropology into actual practices that enhance life. Anthropologists have a lot to contribute to ‘Cultural Gerontology’ mainly because we insist that claims about shared processes of aging and human development can only be made by understanding the range and diversity of ageing around the world. But we also draw on concepts and theories that bridge and blend social science and humanities to make sense of ordinary human life. While it is important for anthropologists of aging to talk to each other, it is also time for us to consider how we might make a greater impact in the broader field of cultural gerontology, where our work is most welcome. First, we need to show up to the party! Thank you to Ulla Kriebernegg and the ENAS organizers for a fantastic conference! Jason Danely is President of AAGE. He is Senior Lecturer of Anthropology at Oxford Brookes University. He has been conducting fieldwork-based ethnographic research looking at aging, caring, grief, and ritual in Japan since 2005. His book, Aging and Loss: Mourning and Maturity in Contemporary Japanwas published in 2014 by Rutgers University Press. He is also editor of Transitions and Transformations: Cultural Perspectives on Aging and the Life Course (Berghahn 2013). From 2011-2015, he served as Editor-in-Chief of Anthropology & Aging, the journal of AAGE. He has received awards from the Fulbright Foundation, the Japan Society for the Promotion of Science, the Center on Age & Community, SSRC and the John Templeton Foundation. He received his PhD in Anthropology from the University of California, San Diego.